The Australian Saltwater Crocodile is the biggest member of the Crocodile family and is also known as the Estuarine Crocodile and the "Saltie". Saltwater Croc's are the largest reptile in the world; males can reach sizes of up to 6 meters in length and there have been reports of Crocs up to 7 metres. Normally though the males average around 4 to 5 metres with the females being quite a bit smaller at about 2.5 to 3 metres. The weight of these large males can be up to and over 1,000 kilograms but usually closer to 400 to 500 kilograms. Their skin colour varies depending on where they live and their size, but ranges from almost black through to grey and olive-brown. They have a large, generally broad knobbly head, heavy jaws with an uneven jaw line and irregular-sized rounded teeth. They eat crustaceans, like Mud Crabs, Turtles, Lizards, Snakes, and Water Birds. The larger adults will also occasionally take much larger prey including Buffalo and domestic livestock. Breeding time is between November and March, the wet season in the north of Australia, and happens in freshwater areas. The female makes a nest from plant material and mud on the river bank, between 40 and 60 eggs are laid which the female watches over, the incubation period is around 90 days but can vary depending on temperature. When the hatchlings start chirping the female digs them out of their nest and helps them to the water in her mouth, she then watches them for up to 5 weeks. The lifespan of the Saltie in the wild is unknown but is expected to be about 50 years, no doubt though there are older individuals than this. The Saltwater Crocodile is an ambush predator, waiting for its prey to get close to the edge of the water and then striking without warning, it uses its strength to drag the animal back into the water. It is a powerful animal, with the strength to drag a fully grown large animal like a cow or water buffalo into the water. The most deadly attack is called the "death roll," this is where the Croc grabs hold of the animal and rolls powerfully. The "death roll" is used to throw any large animal that is struggling off balance and make it easier to drag into the water. The "death roll" is also used for tearing apart larger animals once they are dead. 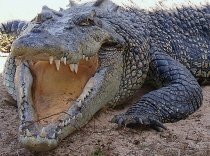 A lot of Australian animals can be dangerous; and as far as dangerous and scary Australian animals go the Saltie is probably the most dangerous and scariest although attacks on humans are not common place occurences. In Australia attacks are rare, on average, no more than one or two fatal attacks are reported per year. Australian Saltwater Crocodiles or Estuarine Crocodiles are found throughout southeast Asia and northern Australia in estuaries, rivers, lagoons and swamps.